Took a long, lovely walk out Holts Run in Allegany State Park. Took mostly color and texture shots for my photography class. 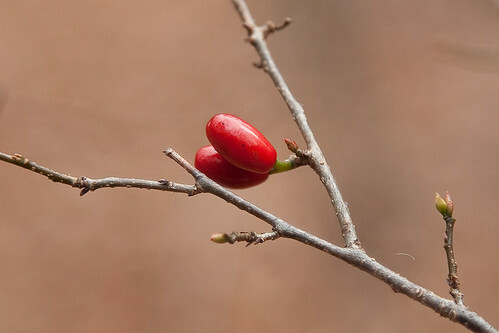 I was very delighted to come across Spicebush with berries! I also ran across a fossil… way up on the steep hillside above the abandonned beaver lodge… an unlikely place! This entry was posted in autumn, fruits and berries, hiking. Bookmark the permalink. What lovely finds! You don’t come across fossils every day. Did you know you can chop up spicebush berries and use them as you would allspice? They’re nice added to applesauce. But even nicer left on the bush. Spirifer mesastrialis from the looks of it. I do love finding Devonian era fossils. Perhaps commonplace, but a nice surprise nonetheless. 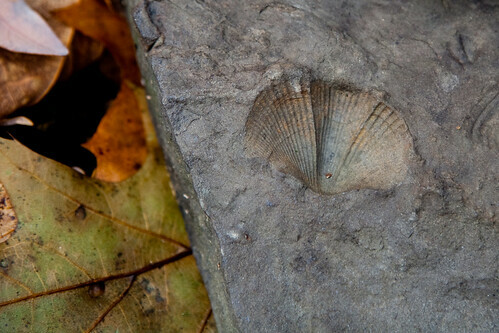 I’d love to stumble upon a fossil on a hike! I like the lines & colors of your photo of it as well. Awesome! I love the fossil too.